Perhaps this scenario sounds familiar: It is a warm spring day, and the local farmers market has finally reopened. Strolling the isles, you see an abundance of peas, strawberries, artichokes, asparagus, radishes, sweet onions, turnips, and rhubarb. The crates are filled to overflowing with shiny, cheerful fruits and veggies winking up at you. Motivated by all of the fresh produce, you resolve on the spot to eat healthier. So you leave the farmers market loaded with a wide variety of fresh fruit and vegetables … and a week or so later, you are tossing those same vegetables – now spotted and limp – into the garbage (or compost bin) because you just didn’t know what to do with them. Asparagus – This is a simple vegetable to cook with, and it only takes a few minutes. First, wash the asparagus and break off the ends. Hold each asparagus spear near the cut end and snap the bottom off. It will break easily – the ends are woody and not edible, but they can be used for soup stock. Now, spread the asparagus out on a cookie sheet and drizzle it with olive oil. Sprinkle it with a little salt and pepper. Bake at 400 degrees for about 15 minutes. Just like that – it’s perfect. If you want a little more flair to your asparagus dish, try making bacon-wrapped asparagus – just wrap each spear with a strip of bacon before baking and increase the cooking time to 20-25 minutes (or until the bacon is cooked). Here’s a perfect lunch: poached eggs with asparagus. You can still bake the asparagus, or you can boil or steam it. To boil asparagus, put about an inch of water in a skillet. Add a dash of salt and bring the water to a boil. Add the asparagus in a single layer and cook for about 5-7 minutes or until it is tender. If you have a steamer, put a little water in the bottom half, add some salt, and bring to a boil. Put the asparagus in the top half and steam 5-10 minutes. Add a poached egg and enjoy. First, wash the artichoke and remove the lower petals. Cut off the stem and add it to your bag of asparagus stems. (Freeze the stems until you are ready to make soup and then use them to make vegetable stock.) Cut the pointy top of the artichoke off. Trim each artichoke leaf — each leaf has a thorny tip; cut just above it. Cut a lemon and squeeze the juice onto the artichoke (artichokes turn brown once they are cut; the lemon will prevent that from happening). Now, to cook it: Put about two inches of water and a dash of salt in a pot. Place the artichoke in the boiling water and cook for about 30-40 minutes (the outer leaves should be easy to pull off). Allow it to cool and then pull the petals off. The softer, white end of the petal is edible, but not all of it. The part that was attached to the heart, near the base, is white and tender – that part is edible. You can dip it in sauce or hummus and bite down on it, pulling the leaf outward. The edible part will detach from the rest of the leaf. Throw the remainder of the leaf away. The inner part of the artichoke is tricky. The inner leaves are prickly, so don’t eat the sharp tips. Pull those off and you’ll see a furry bit that is referred to as the “choke” because that’s what it will happen if you try to eat it. Pull this prickly growth off gently using a fork or a knife. The part that is finally revealed is the artichoke heart – the part of the artichoke that is the most desirable. The hearts can be used to make dip, added to pasta, or even served over chicken. Rhubarb – The stem of the rhubarb is the only part that is edible. The leaves contain oxalic acid and are toxic. If you buy rhubarb whole, cut the tops off and throw the leafy part away. Although it is a vegetable, rhubarb is often used in pie and cake recipes. Rhubarb is tart, so it is usually paired with something sweeter, such as strawberries. Rhubarb is fairly easy to work with, and it may become your springtime favorite. They can even be pickled or baked into bread or cooked into soup. Turnips – look for turnips on the smaller side – they tend to have the best flavor. Turnips are white at the bottom and a light purple toward the top. The greens are delicious; don’t throw them out. Wash the turnips, cut the greens off (and save them for cooking later), and peel the turnips with a vegetable peeler. Now, you can boil them and eat them with nothing more than some salt and pepper, or you can add them to a wide variety of recipes. Or, mash them and eat them like potatoes. Don’t let spring’s fruits and vegetables intimidate you! 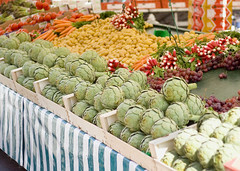 Discovering new recipes and learning to cook new things can be just as much fun as shopping at the farmers market. The next time you’re strolling through those isles, go ahead and stock up!